Mum left us yesterday and one of the points on her list of things to do was to make sure we both eat healthily. She made sure there was fresh fruit and veggies for dad and lots of my tasty biscuits. However, if dad gives me plenty of treats I won’t snitch if he eats junk food! I’m sure we can arrange a mutually beneficial tasty menu! I’m happy to swap treats for silence! 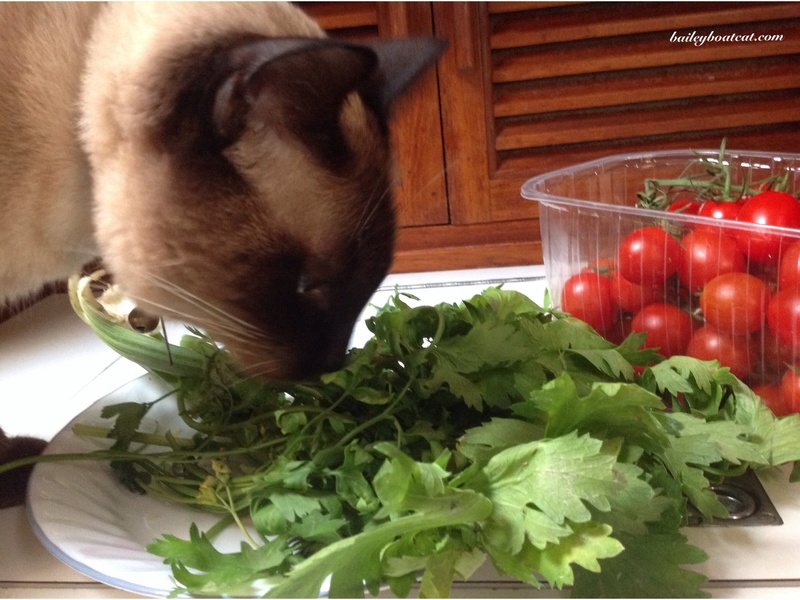 Do you eat healthily or are you like me and unable to resist treats? I don’t eat as healthy as you, Bailey! I love my raw chicken diet that mom makes for me and I hardly ever get regular cat treats, but if mom wants to give me a little bite off of her plate, who am I to say no? I luv me some treats. I like the idea of swapping treats for silence, Bailey! My human eats terribly – but she doesn’t eat much, period. I would eat healthy meals Bailey. Once you start on the wrong foods it is hard to stop and you will put on weight.. You look great now. MOL me can just see ya n Dad reechin a meowtuallee bennyfishall agrremint ’bout guud food n snackz…. 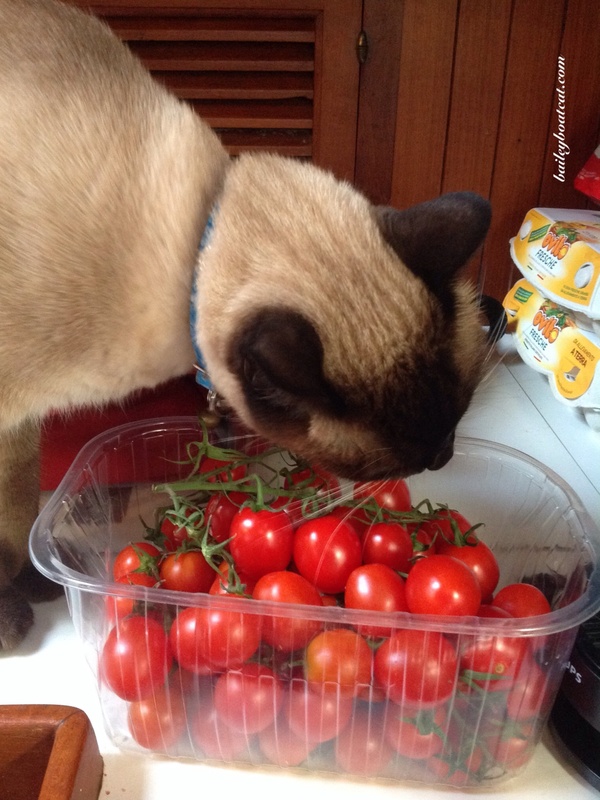 Haz a grrrreat 10 dayz…nom, nom, nom…. Gotta keep your handsome figure, Bailey! I’m a healthy eater but the HuMom and Hitch are both weak when it comes to treats. The naughtiest I ever get is when I revert to my days on the street and lick the salt off a chip or fry. Oh course that would never happen if the chips didn’t come in to the house, so it’s really not MY fault. Here’s wishing you calm seas and a stiff breeze! I eat ANYTHING! Healthy, unhealthy, edible, inedible, dog, human, yummy, poisonous…. Anything. What a question Bailey. 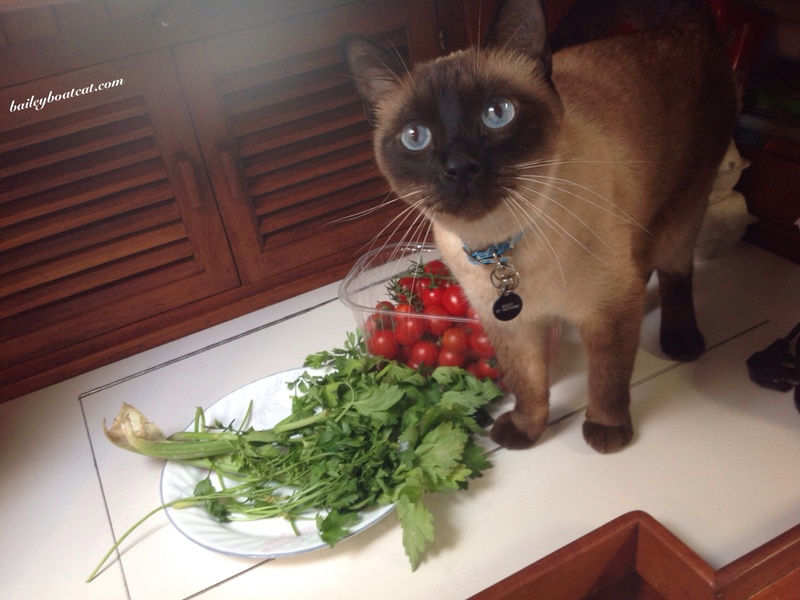 I like my food but who wouldn’t like treats more…Kali is the same We won’t tell on you guys. We’ll admit it, Bailey. We love treats!! I like a little of both Bailey. I like tuna and egg yolks and some fruit and chicken. I also eat my healthy crunchy treats that are good for my teeth as well as the Puffs’ Lil’ Jacks treats which are puppy training treats. Hope you two have a great time batching it while Mom is away!